Research into the genetic basis of Marfan Syndrome and the potentially fatal complications is vital. The total money raised by the Marfans Research Foundation goes directly for Marfan research. The money will be used to examine ways to prevent the aneurismal dilatation of the proximal aortic root that occurs in many patients with Marfans. 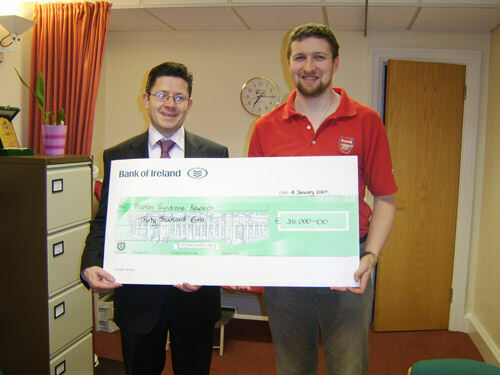 The Marfans Research Foundation forwarded a cheque for €25,000 to Professor Mark Redmond in November 2005. This money is earmarked for The Children’s Research in Crumlin, Dublin for the purpose of ongoing marfan research projects. 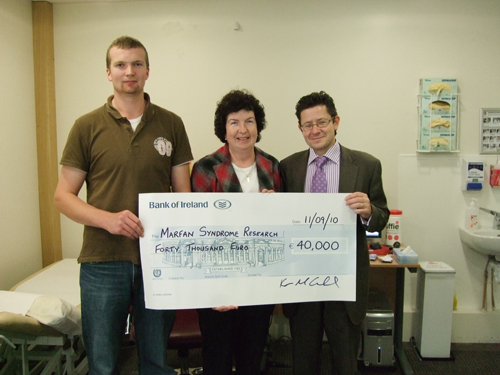 Geraldine and Sean McGrath present a cheque for €25,000 to Professor Mark Redmond (Cardiac Thoracic Surgeon, Mater Hospital and Crumlin Children’s Hospital, Dublin) for the purpose of Marfan Syndrome Research on behalf of The Marfans Research Foundation. The many fundraising events which were held during 2005 include Supermarket Bag Packing, Bucket Collections, a Golf Classic, Charity Walks, a Sponsored Pony and Trap Ride and Christmas Card Sales. We are a very small group of dedicated people based in Kilmacow, County Kilkenny, who work continuously for research. We enjoy enormous support from our community in the South-East of Ireland, particularly from South Kilkenny and Waterford. This support is practical and monetary. Time is precious in this modern age and we really appreciate this. We also receive many donations from overseas. Families in our local community have given us donations which they received when a family member died. They requested donations in lieu of flowers. We are extremely grateful for all donations. Research is the future for all of us. Thanks to the research already done that current marfan sufferers can enjoy a relatively normal life. Our fundraising is ongoing, whilst we generate funds for research, we also heighten awareness. The events in 2006 included Bucket Collections at local supermarkets, a sponsored bike cycle, sponsored Charity Walks, annual Pony and Trap Drive, the annual Table Quiz and the Christmas Bag Pack. The events in 2007 include Bucket Collections at local supermarkets, a donation from the Reid family, Newtown, Kilmacow, County Kilkenny, in memory of their treasured mother, Maureen, Charity Walks, the annual Pony and Trap Drive, the annual Table Quiz, Christmas Cards Sales and The Christmas Bag Pack. 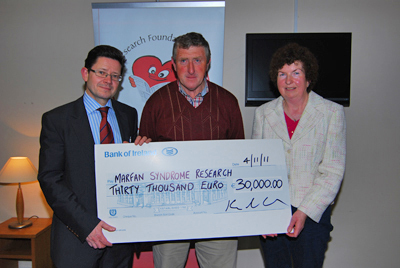 February 2007: Professor Mark Redmond was presented with a cheque for €30,000 from The Marfans Research Foundation. 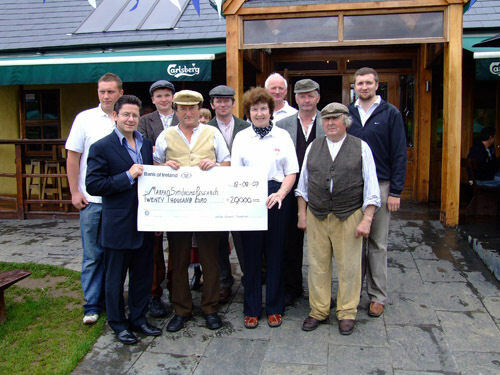 August 2007: Professor Mark Redmond was presented with a cheque for €20,000 from The Marfans Research Foundation when he attended The Pony and Trap Drive at Jack Meades, Halfway House, County Waterford. 2008 was a very busy year. We had numerous events including supermarket bucket collections, Charity Walks, Annual Pony and Trap Drive, Table Quiz, Sponsored Sky Dive, Christmas Card Sales, Christmas Bag Pack and donations from individuals and families. We have a core group of willing volunteers. Most important of all is the generosity of the public who support our fundraising efforts for Marfan research. 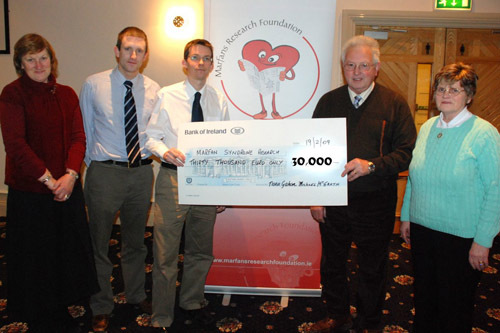 The Marfans Research Foundation held a Marfan Syndrome Information Evening @ The Woodlands Hotel, Waterford on 19th February 2009. Doctors John Byrne and Jonathan McGuiness gave an interesting and informative presentation on marfan syndrome – how it manifests itself and an update on the current research in Ireland. Dr John Byrne explained how he represented Ireland at a medical conference in America which was attended by over 30,000 delegates from all over the world. Dr John spoke about the progress of marfan research in Ireland and that for a small country such as ours we punch way above our weight taking its size and scant resources into account. Dr Darren Mc Laughlin has joined the marfan research team in Ireland. The doctors expressed their sincere appreciation for the funding they receive from The Marfans Research Foundation. They said the results are encouraging. 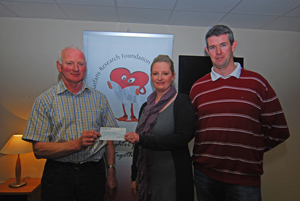 A Cheque for €30,000 was presented for research on the night. Kieran Mc Grath thanked the doctors for coming. He also expressed his sincere gratitude to the loyal volunteers who fundraise on behalf of the Charity and the generosity of the public who support us. This information evening provided an excellent opportunity to detail research progress to date and reassure the public where their donations were directed. There were numerous successful fundraisers in 2009. The events included – Beard Shave and Wax, Charity Walks, Golf Classic, Table Quiz, Annual Pony and Trap Drive, Christmas and Greeting Card Sales, Christmas Bag Pack and individual donations. February 2009: The cheque for €30,000 being presented in The Woodlands Hotel, Waterford on 19th February 2009. This was another busy year of fundraising. Our events included: Beard Shave and Wax, Sr Philomena Purcell’s Charity Walk, The Dublin City Women’s City Marathon, The Annual Pony and Trap Drive, The Dublin City Marathon, Annual Table Quiz and Super Value Christmas Bag Pack and Individual donations. The biggest surprise of the year was Ciaran Mc Dowell’s generous bequest. Ciaran’s Mother, Denise wrote the following tribute to her beloved Ciaran. Despite the current difficult financial climate, the generosity of donors is incredible and uplifting. The dedication of the loyal fundraiser is commendable. This was an action packed year for fundraisers including, Sr Philomena’s Ridley’s Great Baddow Charity Race, Dublin City Women’s Mini Marathon, Fiona Doyle’s Sacrament of Confirmation Donation, Charles Bianconi Pony and Trap Drive, Cork City Women’s Mini Marathon, Annual Showboat Table Quiz and we finished off the year with The Christmas Super Value Bag Pack. The goodwill and generosity of the public never cease to amaze us in Marfans Research Foundation. We appreciate every cent that is donated and can reassure all that it is put to good use as demonstrated by Prof Redmond in his presentation at The Marfan Research Information night at Kilmacow Community Centre.